What would you do to win a £20? A Friend from Ireland has spent about 700 hr’s of hard labour to win a £20 bet from me. He had to build his fantasy wooden bike before I finished my trike. An amazing amount of fantastic craftmanship and inginuity has gone in to the build. The result is stunning. You’ve seen it here first. Expect to see it featured elsewhere very soon! If only the engine was running, I’d have handed over the winnings. 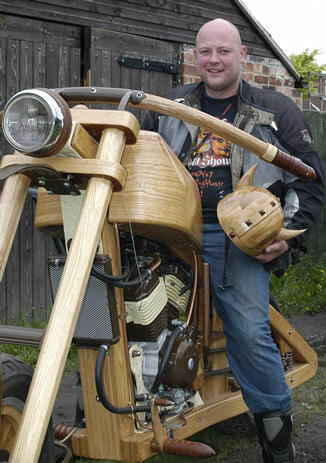 If you want to know more about this wooden motorcycle project , just drop me a comment / response and I’ll see what I can do. This entry was posted on Tuesday, May 11th, 2010 at 1:27 pm	and is filed under I do DIY stuff. You can follow any responses to this entry through the RSS 2.0 feed. You can leave a response, or trackback from your own site. I don’t see point of waisting beautiful wood for another engine-based not friendly to environment thing. If is just for aesthetic reasons I think is the same as killing animals ONLY for fur not for food at all. Hi er, That’s an interesting point of view. The point was to win a bet. Alternatively he could do something un-creative, he could just sit around on his computer all day making really inane comments to just to waste some electricity and increase co2 emissions. Well all I can say is – its nutters like you two who give us bikers a good name. May one suggest a £50 bet to build a Panther 600 with a double adult sidecar complete with roof rack? Great work Gents. I salute you. cool, but i have a technical quetion about the petrol tank, can i chay to you directly? Hi Matthew, Ah I’ve just answered your email. The actual petrol tank is steel the timber is a cover. I’d rather keep the questions and answers public, you never know who else might want to know the same. Hi…thats cool…but with the filler spout to the tank…did you have to lengthen it? Have you had many components break? How fast have you driven on it? Does the frame or wheels creak or make noise while riding? GOOD JOB!!! AWESOME WORK!!! Hi, Latest reports, nothing broken, nothing creaking, over sixty mph but the brakes need improving. Great fun! and two rally best in show trophies. If I remember right he custom built the tank so the spout is a tube welded on and the fitting from a scrap tank welded to that. Great job “Andy The Stuff Doer”! A wonderful real example of a positive possibility, that I would like to see become More. You have ably demonstrated what can be achieved with wood. We have a lot of Oak here in the hills below the Sierra Mountains and I see this a sustainable resource…if managed properly. I also see these Oak Trees as a source of income for a People struggling to survive the depredations of Humanity’s corporate world. We the Workers Of America can use an economic independence from what the corporations have wrought. Become Our Own bosses and equally share the profits of a profitable enterprise. We the Workers of America can use hand crafted transportation that costs less than the corporate products. Yes. There are many obstacles to overcome. Things like coming to agreement on the final designs to be produced. And exploring ways to make the electric motor, itself, have as much wood involved in its case construction. And, of course, getting the Workers and necessary tools together, into a place or places of production. Anyway. Just wanted to express appreciation for what you have achieved. it gives me Hope in my Woobus quest. I might come back here to find out if you would like to come show Us what you have learned in your work. That all sounds a very noble ambition also very challenging. If you have access to sustainable timber I’m sure there are many products that could be produced with less challenging technical considerations. Also requiring less initial investment in development and machinery. Getting a timber based transport device to market at the right right price could be an end goal funded by lower tech products with similar “green” credentials. On the worker owned front have you investigated the “Basque worker cooperatives” some very successful and interesting organisations. Hi Andy. Thanks for the sincere and honest reply. Working up to the “ultimate” goal of a timber based transport device is a good strategy. It might well prove to be the only way, We can achieve it. But, you know,? It is strange, but I ran into a young acquaintance, one day after I wrote you, that might give this effort a good jump start. His Father passed on to his reward and left him a quite extensive (so the young man says…I haven’t seen it yet) machine shop. These tools were for metal working but Travis thinks they can be used for wood working too. He mentioned drill presses and cut off saws and “mills”. I hope to see this place soon. It sounds like it is not being used for anything now. We’ll see. We spoke a bit about making electric motors, with wooden cases, from scratch. He said he has rewound alternators and didn’t think the construction of motors would be too difficult…once We settle on a good workable design. Yes. I have heard of the Basque Worker Cooperatives. Mainly “Mondragon “. They have been part of my inspiration and motivation to try this. If it is ok with you, If things develop, I will get back to you to report them.